The Cotes d'Armor look towards sourthern England and the English channel. 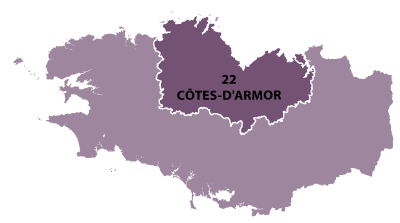 This department changed names a few years ago and from the Côtes du Nord to Cotes d'Armor. 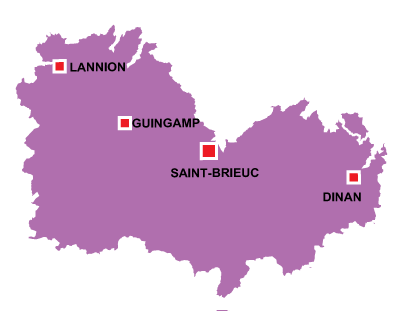 A beautiful coast line with bays such as the Cote Emerald and small fishing villages like Paimpol and Pluoha. Caravan & Camping Park, Bar and Bistro in the Heart of Brittany. 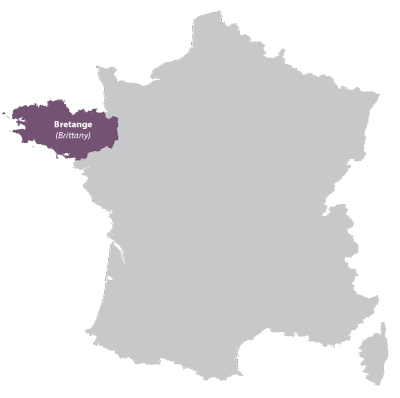 One of best selection of Gites for rent in Brittany, the rental price, quality and price make these holiday homes an ideal choice for your vacations by the sea in Bretagne. From two to four persons, the comfort and traditional design of the stone houses, with garden ( 1500 sq/ft), wood fire, tv and much more. Located on the beaches of Perros-Guirec on the emeradle coast of Brittany, flats and studios for rent.